TOKYO (AP) — Former U.N. Secretary-General Ban Ki-moon urged North Korean leader Kim Jong Un on Monday to take concrete steps toward complete denuclearization and gain the trust of the international community if he wants sanctions lifted. Ban, a former South Korean foreign minister, said "this is the time" to achieve North Korea's denuclearization after nearly a quarter century of unsuccessful efforts, and that the North and the world should not lose this opportunity. THE HAGUE, Netherlands (AP) — Former United Nations Secretary-General Ban Ki-moon appealed for a sense of urgency Tuesday as he launched a new commission that aims to accelerate and expand ways the world can prepare for climate change. "Without urgent adaptation action, we risk undermining food, energy and water security for decades to come," Ban told guests as the Global Commission on Adaptation got underway in The Hague. NEW YORK (AP) — A nephew of former U.N. Secretary-General Ban Ki-moon has been sentenced to six months in prison in a bribery case. Joo Hyun Bahn was sentenced Thursday in Manhattan federal court for his role in trying to pay $2.5 million in bribes to rescue a failed $800 million Vietnam real estate deal. The sentencing followed Bahn's January guilty plea to conspiracy and violating the Foreign Corrupt Practices Act. The crimes were committed from 2013 to 2015. UNITED NATIONS (AP) — The U.N.'s new envoy for climate action, former New York Mayor Michael Bloomberg, said Monday that President Donald Trump can become "a great leader" if he changes his mind about global warming and keeps the United States in the Paris climate agreement. NEWTON, Mass. 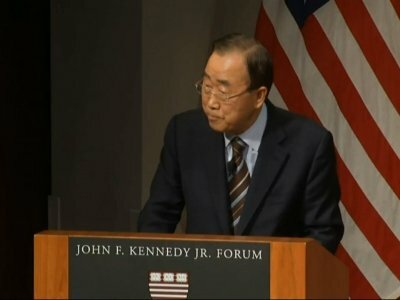 (AP) — Former U.N. Secretary-General Ban Ki-moon is making an appearance at Boston College. Ban was South Korea's foreign minister before serving 10 years as U.N. chief. He's scheduled to speak Tuesday on "human welfare and global citizenship." UNITED NATIONS (AP) — Former U.N. secretary-general Ban Ki-moon said Wednesday the dialogue between the two Koreas that began during the Winter Olympics must be kept alive so it can hopefully lead to reconciliation, peace and the denuclearization of North Korea. CAMBRIDGE, Mass. (AP) — Elton John has been honored at Harvard University for his philanthropic efforts to fight HIV and AIDS. The 70-year-old singer was awarded the Harvard Foundation's Peter J. Gomes Humanitarian Award in a ceremony Monday. Previous winners include former South African Archbishop Desmond Tutu and former Secretaries General of the United Nations Ban Ki-moon, Kofi Annan, Boutros Boutros-Ghali and Javier Perez de Cuellar. NEW YORK (AP) — Elton John will receive an award from Harvard University next month for his philanthropic efforts to fight HIV and AIDS. The Elton John AIDS Foundation announced Tuesday that the 70-year-old singer will be awarded the Harvard Foundation's Peter J. Gomes Humanitarian Award on Nov. 6. Previous winners include Archbishop Desmond Tutu and Secretaries General of the United Nations Ban Ki-moon, Kofi Annan, Boutrous-Boutrous Ghali and Javier Perez de Quellar. UNITED NATIONS (AP) — Saudi Arabia's U.N. envoy said Friday "there is no justification whatsoever" for the Saudi-led coalition fighting rebels in Yemen to be on a U.N. blacklist for killing and injuring nearly 700 children in 2016. Ambassador Abdallah Al-Mouallimi rejected "the inaccurate and misleading information and figures" in the U.N.'s annual report on Children and Armed Conflict. UNITED NATIONS (AP) — The Saudi Arabia-led coalition fighting rebels in Yemen has been placed on a U.N. blacklist for killing and maiming nearly 700 children and attacking schools and hospitals in 2016. The issue of whether the U.S.-backed coalition would be on the list has been eagerly awaited because last year the coalition was put on the blacklist but removed by then-Secretary-General Ban Ki-moon under intense pressure from Saudi Arabia. LIMA, Peru (AP) — As soon as he got the job, the new ethics chair of the International Olympic Committee received an earful, as well. Former U.N. secretary general Ban Ki-moon was elected to his new position Thursday — handed the task of restoring credibility to an organization that, according to its own members, is getting "hammered" by an onslaught of unsavory scandals. LIMA, Peru (AP) — Former United Nations secretary general Ban Ki-moon has been elected chair of the International Olympic Committee's ethics commission. The South Korean, who served as leader in the U.N. from 2007 through 2016, will take over for Youssoupha Ndiaye. In his acceptance speech Thursday, Ban called his new task "a serious responsibility." UNITED NATIONS (AP) — Secretary-General Antonio Guterres says in a draft report that the Saudi-led coalition was responsible for more than half the children killed and injured in Yemen's civil war last year. The report, obtained Thursday by The Associated Press, said the United Nations verified 1,340 casualties and attributed 683 — representing 51 percent — to attacks carried out by the coalition. UNITED NATIONS (AP) — The General Assembly adopted a resolution Thursday backing the U.N. chief's appeal to member states to transfer $40.5 million in unspent funds from Haiti's peacekeeping mission to help victims of a cholera outbreak that has afflicted over 800,000 people. UNITED NATIONS (AP) — Former U.N. Secretary-General Ban Ki-moon is joining The Elders, the group of former world leaders founded by Nelson Mandela to promote peace, justice and human rights worldwide. His predecessor as secretary-general, Kofi Annan, is chairman of The Elders. He said Friday in announcing the appointment that Ban "will bring a unique and valuable perspective based on his record of global leadership and understanding of geopolitics." BOSTON (AP) — Former United Nations Secretary-General Ban Ki-moon (BAHN'-gee-moon) has spoken at the John F. Kennedy Presidential Library & Museum in Boston. The U.N.'s eighth secretary-general discussed global issues and his diplomatic career at a forum moderated Wednesday by David Gergen, a CNN senior political analyst and co-director of the Center for Public Leadership at the Harvard Kennedy School. MADRID (AP) — Donald Trump should stand "on the right side of history" by reconsidering the decision to pull the United States out of the Paris climate change accord, former United Nations chief Ban Ki-moon said Wednesday. BUENOS AIRES, Argentina (AP) — Argentina's Foreign Minister Susana Malcorra has resigned for personal reasons, President Mauricio Macri said on Monday. Malcorra was named to the post in 2015 and was a key figure in Macri's strategy to repair relations with the United States after years of antagonism under his left-leaning predecessor, Cristina Fernandez. Malcorra previously had served as cabinet chief for U.N. Secretary General Ban Ki-moon since 2012. UNITED NATIONS (AP) — A network of organizations seeking to protect children in conflict urged U.N. Secretary-General Antonio Guterres on Wednesday to add 11 parties to the blacklist of countries and armed groups responsible for grave violations against children. UNITED NATIONS (AP) — U.N. Secretary-General Antonio Guterres on Monday appointed a Norwegian diplomat who dealt with the Colombian peace process to try to settle the longstanding border dispute between Venezuela and Guyana by the end of the year. U.N. spokesman Stephane Dujarric announced the appointment of Dag Halvor Nylander as Guterres' personal representative "with a strengthened mandate of mediation." UNITED NATIONS (AP) — Secretary-General Antonio Guterres has appointed Tanzania's former chief justice to review potential new information, including from South Africa, on the mysterious 1961 plane crash that killed U.N. Secretary-General Dag Hammarskjold. SEOUL, South Korea (AP) — Former U.N. Secretary-General Ban Ki-moon said Wednesday that he won't run for South Korea's presidency, a surprise announcement that removes a key figure from the scramble to replace impeached President Park Geun-hye and further stirs the country's already tumultuous politics. WELLINGTON, New Zealand (AP) — Former New Zealand prime minister Helen Clark told her staff on Thursday that she's stepping down from her senior role at the United Nations when her term expires in April. The move comes three months after Clark failed in her bid to land the U.N.'s top job. Clark has headed the U.N. Development Program for the past seven years. The 66-year-old wrote a message to staff saying she was leaving April 19 at the conclusion of her second four-year term. Former U.N. Secretary-General Ban Ki-moon said last week that he would announce soon whether he will run for South Korea's presidency, as he returned home and strongly hinted at his political ambitions before hundreds of cheering supporters. Ban's return will likely heat up local politics as he's considered the only major conservative contender in a possible early election to replace impeached President Park Geun-hye. BELGRADE, Serbia (AP) — Former Serbian Foreign Minister Vuk Jeremic says he is running for Serbia's presidency in this year's election. Jeremic formally announced the decision Sunday in Belgrade. It was not immediately clear if any key political parties are backing his candidacy. SEOUL, South Korea (AP) — Former U.N. Secretary-General Ban Ki-moon said Thursday he will announce soon whether he will run for South Korea's presidency, as he returned home and strongly hinted at his political ambitions before hundreds of cheering supporters. NEW YORK (AP) — Two relatives of former U.N. Secretary-General Ban Ki-moon were charged in an indictment unsealed Tuesday with plotting to bribe a Middle East official to influence the $800 million sale of a building complex in Vietnam. Ban's nephew, Joo Hyun Bahn, was released on $250,000 bail over the objections of prosecutors, who sought to deny bail on the grounds that he is a flight risk and a financial threat to his community. Though charged, Bahn's father, Ban Ki Sang, was not in custody. UNITED NATIONS (AP) — The new U.N. secretary-general said Tuesday he's "no miracle maker" but Antonio Guterres has big ambitions: He wants to shake up the global body and get all 193 member nations to come together to solve the "terrible problems" the world is facing. Speaking on his first day at U.N. headquarters after taking the organization's reins from Ban Ki-moon, Guterres said conflicts are multiplying and interlinked, and have triggered "this new phenomenon of global terrorism." An estimated 1 million revelers have rung in the new year in Times Square. UNITED NATIONS (AP) — Ban Ki-moon ends 10 years at the helm of the United Nations lamenting the "fires still burning" from Syria to South Sudan but buoyed by a global agreement to combat climate change and new U.N. goals to fight poverty and inequality. UNITED NATIONS (AP) — Ban Ki-moon joked to hundreds of diplomats and U.N. staff as he left United Nations headquarters Friday for the last time as secretary-general that he feels "like Cinderella — tomorrow at midnight, everything changes." Flanked by the presidents of the General Assembly and the Security Council, the native South Korean thanked U.N. workers for their hard work and commitment over the course of his 10-year tenure, which ends at midnight Dec. 31. SEOUL, South Korea (AP) — While lawyers desperately tried to restore the impeached South Korean president's powers, politics advanced without her Tuesday as parties and potential candidates postured for elections that could take place in just months. NEW YORK (AP) — United Nations Secretary-General Ban Ki-moon will perform one last ceremonial duty before ending his 10-year leadership of the world body. Organizers of the Times Square New Year's Eve celebration announced Monday that Ban will push the Waterford crystal button to begin the official 60-second countdown to 2017. U.N. Secretary-General Ban Ki-moon is calling a Security Council resolution condemning Israeli settlements and demanding an immediate end to new construction "a significant step" to reconfirm the vision of a two-state solution with the Palestinians. SEOUL, South Korea (AP) — North Korea on Friday mocked outgoing United Nations Secretary-General Ban Ki-moon over his apparent ambitions to run for South Korean president, calling him an opportunistic "chameleon in a human mask" who's dreaming a "hollow dream." The North's state-run Uriminzokkiri website said Ban's alleged presidential ambitions were absurd because the way he handled his job as U.N. chief for the past 10 years has left him living in "criticism and shame." ADDIS ABABA, Ethiopia (AP) — A Japanese official says an arms embargo on South Sudan is "not productive," even as the United States pushes Japan and other U.N Security Council members to impose one amid warnings of possible genocide. Okamura Yoshifumi, special adviser to Japan's prime minister, spoke after visiting South Sudan, where Japan has 350 U.N. peacekeepers. U.N. chief Ban Ki-moon this week said South Sudan will head toward genocide unless immediate action is taken on an arms embargo. SPRINGFIELD, Ill. (AP) — United Nations Secretary-General Ban Ki-moon has traveled to Illinois in his final days in office. The (Springfield) State-Journal Register reports the outgoing secretary-general stopped Wednesday at Abraham Lincoln's tomb. He said the 16th president "exemplified how a leader can inspire people to unite and reconcile and integrate." While in Springfield, Ban also visited the Abraham Lincoln Presidential Library and Museum. UNITED NATIONS (AP) — A U.N. board of inquiry says it received reports that an attack on an aid convoy on the outskirts of Aleppo in September was "highly likely" to have been carried out by the Syrian air force but it was unable to reach a definitive conclusion. A summary of the board's report released late Wednesday by Secretary-General Ban Ki-moon also said its members "did not have evidence to conclude that the incident was a deliberate attack on a humanitarian target." UNITED NATIONS (AP) — The president of the U.N. General Assembly called Fidel Castro "one of the 20th century's most iconic and influential leaders" at a memorial tribute Tuesday to the late commander of the Cuban revolution who led his country for nearly 50 years. Peter Thompson told the ceremony in the assembly chamber that for many people Castro "embodied the struggle of the global south for independence, justice and development." UNITED NATIONS (AP) — Outgoing U.N. Secretary-General Ban Ki-moon called Tuesday on all countries to investigate and prosecute cases of human trafficking and said the most vulnerable victims are women, children and refugees caught up in conflict areas around the globe. UNITED NATIONS (AP) — Secretary-General Ban Ki-moon warned Monday that South Sudan will be heading toward genocide unless immediate action is taken to impose an arms embargo and pressure leaders of the world's newest nation to end hate speech, incitement and violence. The U.N. chief said instability in South Sudan is threatening the region and he urged the Security Council to impose an arms embargo, which would "diminish the capacity of all sides to wage war." UNITED NATIONS (AP) — Secretary-General Ban Ki-moon addressed mounting speculation that he will run for president of South Korea on Friday, saying he will decide how to best help his country when he returns home in early January after 10 years as U.N. chief. Ban told his final U.N. press conference that after taking some rest he plans to meet "as many people as possible," including political leaders, members of civil society and his friends.